Ultimate speed tests on live sites have started!!!!!! Are you getting all the low hanging, easy fruit to speed up your site? After 3 months of deep study and testing, I’m thrilled to share that ultimate speed tests on live sites are underway. We finally confirmed, 100%, the Cloudflare speed setting that goofs member and e-comm sites, and any other type of site where you have subscribers log in, like BuddyPress forums and such. What we could not confirm is why that setting got stuck and would not clear for up to 3 days after it was changed. But, the main thing is, we know what it is, and all of my members have been able to access tutorials since last week. So, now I’m ready to apply the other speed settings to all BlogAid related sites later this week. In fact, I’ll probably start on those tomorrow. And, I’ve already got tests underway for the first of my site audit clients who volunteered for ultimate speed tweaks too, and that’s going very well. And, as soon as I finish up with BlogAid and these client sites, I’ll be releasing my Webmaster speed tutorials too. 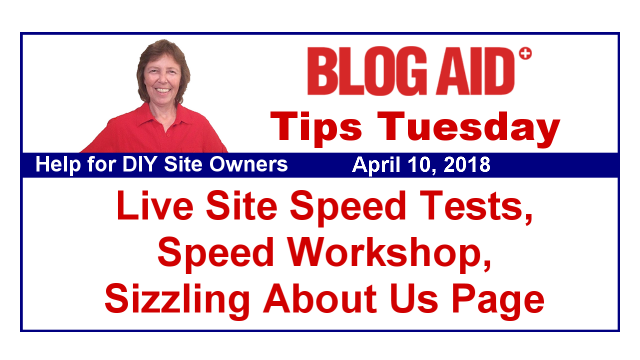 In fact, I’m thinking we’ll be doing a workshop to get everyone up to speed, pun intended, as quickly as possible, since these speed tests went a month longer than I had planned. I’ve already updated the tutorials in Level 4 for performance testers. And those are super critically important, as you have to identify what’s slowing down the site first. That also includes back end checks at the host for useless bulk and security issues. There is no magic bullet to overcome sheer page and hosting weight. And that’s all the easy, low hanging fruit to take care of first. Then you apply the deeper speed tweaks. I see so many folks just run speed tests and try to go on the scores without having any clue what goes into making up those scores. And then they just throw speed plugins at the problem and never configure them properly. And then they complain the plugin doesn’t work. That’s going at the whole problem backwards. And that’s why we start with a site audit first. In that 20-30 page report and 2 hour live chat, you will see as clearly as I do what the problems are. You wouldn’t believe how much difference it makes just to relieve the site of resource hog plugins and substitute them with better choices. So, never overlook the power of the easy stuff!!! I’m thrilled so many folks jumped quickly to get their site audits done, as well as their HTTPS conversion last month. We’re working toward the last of that wait list now, and will be getting everyone still on the wait list started before end of the month. And that means now is a good time for you to get your site on the list. That way you’ll be sure you’re well ahead of Google’s July deadline for both speed and HTTPS. Most of us are using the free Let’s Encrypt SSL Certificate from our host for our HTTPS stuff. But, if you’re on a paid certificate, ensure it is not issued by Symantec at your host. Last year, they didn’t give due diligence to verifying who was buying the certificate and issued one for a Google domain to a non-Google related company. So, Google took their revenge by making Chrome not trust that certificate and will pop a huge warning up for any sites using it. You can probably easily see what SSL certificate you have via your hosting cPanel. But, if you can’t, then just ask your host who the issuer is. As y’all have heard me say for months now, Google will officially consider speed an SEO ranking factor in July. And, you might be wondering what they will rely on to see how fast your site is. That data will come from Chrome browser users. You can see what Google thinks is being reported on your site in the Google PageSpeed Insights test. I reported this to you several months ago in Tips Tuesday. And so far, most of us are seeing no speed data. Instead, we are seeing a message that not enough data has been gathered to report anything. I’m betting it’s going to take the rest of the year before most of us see much of anything reported. And to top it off, so many cell phone users are on iPhones and using Safari as their browser. So, even when there is enough data to report, it will be skewed more toward Android users only. Plus, it will only collect data on Chrome browsers that have a setting turned on to share such anonymous info. In the aftermath of the Facebook privacy hoohaa, betting more and more folks are going to become sensitive about sharing any data this way. So, not sure how long it will take Google to collect enough data on each site to be statistically viable by this means. However, what I do know is that more and more site owners are going to jump on the speed bandwagon. And that means visitors are going to get used to fast sites and become more and more intolerant of slow ones. And that means they are going to bounce and never see your ads or offers or other money making things. The time to change how you do things with your site is now, before you have a massive loss of revenue, if you’re not seeing that already with all the hoohaa happening at Pinterest. Diversify your traffic streams now and get ahead of the wave of change that’s coming. Every page on your site is a sales page. That includes your About Us page. In fact, it is one of the most important pages on your site, not only for conversion, but for SEO. There are all kinds of SEO tricks you need to employ on your About page. That’s the kind of stuff we cover in my DIY SEO https://learn.blogaid.net course. And then there’s the copy and design of the page to consider too. There are all manner of conversion points you need to be getting on your About page. This nice post from Torque also covers some design elements you want to consider as well. That includes creating a special page template for that page so it looks almost like a landing page. So, go check it out and open your mind to just how powerful this one page can be for your site success. FYI, if you used the stop word removal function in the Yoast SEO plugin to take out words from your permalink like a, the, of, and such, then you’ll need to manually start performing that duty. That function has been removed in the latest Yoast SEO update. And all I can say is good riddance. I never thought that was a worthwhile idea compared to the risk of getting a -2 on the permalink if you write about the same sorts of things all the time. Doing it manually has risks too, like misspellings, capitalizing words, and forgetting the hyphens. There is just too little SEO gain in doing it to make it worthwhile, IMO. Not to mention that it makes your permalinks look a little spammy. Last week, I reported that there were some strange things going on at SiteGround. They seem to be resolved for the two clients I was working with that were affected. Just know that when things like this pop up, some of it is out of the host’s control. Like this EasyApache update from cPanel. There was a bug in it and that could have caused some servers to be unavailable for a while. Hosts are forced to do updates to all the softwares they use on their servers. It’s sort of like the Operating Systems (OS) we use on our computers and phones and such. Sometimes the host can work around it, and sometimes they can’t. Just be mindful that they are doing all they can to keep your site live at all times. And be mindful that they often take the blame from angry clients, even when it’s not their fault. So, go easy on your host when things pop up and find out what the real problem is before you fly off the handle at them. I just had to rant a little last week. Hosts know hosting, not WordPress. They are not qualified to do the work. They are server admins, not webmasters, not devs, not designers. For that matter, most designers aren’t qualified to do tech work either. Most come from a graphic arts background. Most don’t know the tech, like security, speed, HTTPS, and SEO. Great post! I loved your rant : ) I could listen to you talk all day! Thanks Tipper!! I try not to rant much, but some things just get under my skin when folks are not getting the help they need.